Freshstop at Caltex Wetlands offers our customers convenience on the go, 24 hours, with snacks, fresh produce options and Crispy Chicken for hot food on the go. Stop by for some gourmet coffee with LavAzza. For more convenience you can also find restrooms and a self help counter. While swiping your UCount rewards card when you fill up. 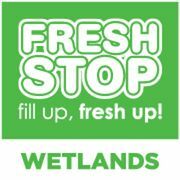 Rate and review FreshStop at Caltex Wetlands in Milnerton, South Africa! Share your experiences at FreshStop at Caltex Wetlands with your friends or discover more Gas and Service Stations in Milnerton, South Africa.